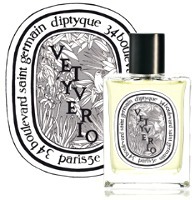 Vetyverio is the latest fragrance release from French niche line Diptyque. They reportedly "had a fun time blurring the lines by blending perfumery’s archetypal raw materials, namely masculine vetiver and feminine flower bouquets". In other words, it's a unisex, although Diptyque, like many fragrance companies, prefers not to use that particular word, stating simply that it is neither masculine nor feminine. Vetyverio starts out bright and fresh and energetic, with peppery citrus and leafy green notes (the notes: mandarin, grapefruit, lemon, bergamot, ylang ylang, Turkish rose, geranium, vetiver, carrot seeds, nutmeg, apricot, clove, cedar and musk). After that, it's an exercise in subtlety: everything, from the florals to the vetiver to the spices, speaks in muted tones. The rose is noticeable but does not take center stage. It is just as advertised — men will not find it too floral, women will not find it too heavy on the vetiver. The middle stages are neither sweet nor dry, and have a lightly nutty undertone. The spices, while subtle, lend some liveliness. I would not have pegged it as a vetiver-focused fragrance at all until very near the end, when it does get considerably drier and woodier, and the vetiver, finally, comes to the fore. Still, it's not a deep, rooty vetiver: it's a pale, summery sort of vetiver. It's earthy, maybe even very earthy, but as vetiver fragrances go, it's on the lower end of the scale for earthy, and true vetiver fiends who are after another specimen for their collection might find it disappointing. Vetyverio is an enjoyable fragrance, probably more suited to warm than cold weather wear. It's well executed and I like it fine; if I'm not absolutely wild about it that might be because I have so many vetiver fragrances already: to catch my attention with a new one, it has to be more surprising than Vetyverio. There are, admittedly, a few vetivers that I find perhaps too masculine to wear comfortably — Maître Parfumeur et Gantier Route du Vetiver comes to mind — but not many, and for that matter, there are lots of wonderful light, sharable vetivers out there already. But if you haven't found your perfect vetiver, Vetyverio is absolutely worth trying. Diptyque Vetyverio was developed by perfumer Olivier Pescheux. It is available in 50 and 100 ml Eau de Toilette; for buying information, see the listing for Diptyque under Perfume Houses. My favorite vetiver so far (and by far) is Sycomore: I love it’s smoky facet. I also enjoy vetiver tonka from time to time, though admittedly I don’t wear it much! Excellent review, Robin. You’ve probably answered this question a hundred times, and if you have I apologize, but what are your favorite vetivers? Guerlain Vetiver, FM Vetiver Extraordinaire, LesNez Turtle Vetiver #1, Hermes Vetiver Tonka, Lalique Encre Noire. For lighter vetiver, Chanel Sycomore really is wonderful. Also like Kenzo Air, OJ Zizan. Vettiveru! My fave light one. Oh thank you — that’s another nice one! Thanks, Robin! I’ve got a wonderful botlte of vintage Guerlain Vetiver, and I definitely need to try the Hermes. Unfortunately, Sycomore turns “dirty ashtray” on me. They actually list a note called ‘burning woods’ – I’ll say! I love that part, but I know not everyone does. Laughing a bit that you consider Sycomore “lighter.” I think it might be my favorite, and I don’t get the wood smoke that people talk about so often. Someone complimented me on it in a movie theater once when I had layered with Terre d’Hermes. I wore it last week and LOVE how thoroughly it permeates my t-shirt, which I then wear to bed for a couple nights in a row. Well, it’s lighter than Vetiver Extraordinaire or the Turtle Vetiver, right? I guess it’s probably about the same as the Guerlain, and the Hermes is somewhere in between? Or do you think that’s crazy? No, not crazy. I just consider Sycomore a very “vetiver blast” fragrance. Ask March what she thinks about its thermonuclear properties. It’s deceptively easy to over-apply, I think. Thanks for the review, Robin! Good to the see the list of notes because I was picking up the spices but wasn’t sure what they were. Diptyque kindly sent me a couple of samples last week and my impressions were pretty much the same – nice but not a must have. Not enough vetiver for my liking and what’s there is very clean and lacking that lovely… raspy quality that some vetiver fragrances have. Sycomore and Vetiver Tonka are still my favourites. I really like Diptyque — but sort of wish they’d move away from the lighter fragrances they’ve been doing the last 5 years or so. It’s not that they’re bad at all, just that it’s been a long time since they’d done anything that made much of a statement. I know what you mean. You’d think that after those 3 (or is it 4 now?) colognes/eaux they brought out they’d be in the mood for something different. Re: Diptyque’s direction. I’m going to toot the horn of L’Eau de Tarocco again, which I think is worth repeated testing for those who passed it by. When sprayed (do try it sprayed), it’s actually tenacious and delicious and doesn’t wimp out on me — the orange and saffron and slight but discernible rosewater note remind me of delectable Persian desserts. I wore the hell out of it last summer and may do again. Oh, again, don’t get me wrong — I think they’ve mostly (exception being Lierre) been really nice scents. Just a lot of light things in a row, and wish they’d do a deeper fragrance for a change, something that made a big statement. The Diptyque boutique in SF had a tester of Eau Duelle, which is coming out in September. A very sweet vanilla, but since I only smelled in on a strip, I have no idea how strong it is. It’s a strange scent for them, as if a vegetarian friend made you a hamburger. Oh, good to hear it — thanks! I got to try it on my UK trip and enjoyed it a lot. It sat comfortably on me in it’s mutedness :). It sits comfortably on me too…don’t get me wrong, I really enjoyed wearing it. And would guess it will do well. I definitely fall under the “haven’t found my perfect vetiver fragrance” category. In fact, I have struggled to appreciate vetiver as a note to this point. I LOVE most of Andy Tauer’s frags, but Vetiver Dance doesn’t do much for me. Probably everyone on NST knows I’m rabid about Shaal Nur (since I mention it in practically every post!) but unlike Turin & Snachez in The Guide, it does not strike me as a vetiver scent. Robin, do you think that Vetyverio would be a good “gateway” vetiver frag, or is the vetiver too hidden amongst the supporting notes? Anyone else here have some recs for a gateway vetiver scent that might convert me to a veti-lover? Or am I doomed to think “meh” every time I smell a vetiver? I wonder if you’d like Jo Malone vetiver? It really grew on me and caused me to have more of an interest in vetiver. Although I think of it as more of a nutmeg scent than a vetiver scent! JM also do that Black Vetyver Cafe (vetiver and coffee) which is lovely. Jill, I love the JM Vetiver and sometimes layer it with other perfumes as it makes a light rooty base, altho’ I think if you overdo the spraying it can smell a bit like wee!. It’s this particular vetiver that Jayne Ormonde’s Tiare reminds me of – I’d be interested to know if anyone else gets that. You’re so right about the overspraying, LOL! It needs to be sprayed pretty lightly. I love your idea of using it as a base, I haven’t tried that yet. I haven’t tried the Tiare — interesting comparison though! Well, it might well be a gateway vetiver! And have you tried Sycomore or Kenzo Air? Oh, or the Vetiver in the Armani Prive line? Sycomore again! Have to try that one. SOTD is Guerlain’s Vetiver pour Elle, which makes me fear I might have missed the vetiver bus and should have gone for regular old Vetiver on the split! I like TDC Sel de Vetiver too. And, as usual, nice review, Robin! Will add Comme des Garcons Vettiveru, which Tama mentions above. I didn’t get all that much vetiver out of Shaal Nur either… although I admit that my attention may have been seized by the patchouli bludgeoning me about the head and face. LOL! I don’t think of it as a “vetiver fragrance” either. I get a definite, beautiful vetiver in Shaal Nur, and the patchouli isn’t strong for me. I wouldn’t call it an incense fragrance or a vetiver fragrance, though, because of all the other wonderfulness going on. I think of it as an incense. Doesn’t matter though, it’s great stuff! If you like rose I suggest trying Écume de Rose by Parfums de Rosine. It has a lovely vetiver drydown. Armani Privé Vetiver Babylone is other favourite of mine. K-Scott, I also love Shaal Nur and would not have identified it as a vetiver fragrance, either. The vetiver that I wear the most is Annick Goutal. It has a sort of reflective mood that I appreciate, and it might make a good “gateway” vetiver. it’s worth sampling if you get a chance. I’m loving this mini-conversation here—I haven’t made friends with vetiver yet…don’t know if I ever will really. I do like Sycomore and maybe this Diptyque will lead me to vetiver like Philosykos opened my nostrils to fig….I’m really looking forward to testing Vetyverio….which is funny because based on the name I sort of ignored this post today. I didn’t have much extra time, figured so what if I missed a post about a vetiver fragrance….lesson learned: NEVER ignore a post on NST!!! Thanks for the review — this sounds nice and I’ll probably give it a try sometime. Vetiver Tonka, so far, maintains its spot as my all-time favorite vetiver. Guess I need to try that one. Drat. Keep thinking my vetiver list is shrinking, but no. “Floral” is probably about the only way I’m ever going to enjoy vetiver. So far the only vetiver fragrance I like is No. 19, and as any fool knows, that’s nota vetiver-focused fragrance at all. Might try this one if a sample comes my way. Have not tried Vetiver Tonka – the mere idea of mingling those two notes makes me sort of queasy. Have you tried Guerlain Vetiver Pour Elle? Not so easy to find, unfortunately, but has more of a floral character than this one. Same here. For me, it’s a like but not a love. Vetiver pour Elle is a lovely one. Been agonizing over a purchase for a while. Mals: I’ll join you in enjoying the vetiver — subtle, but present– in the über-elegant N° 19, one of my three favorite Chanels. Although it might be more on the masculine side of unisex, I love Lubin Vetiver. It’s one of my favorite summer fragrances. And although I love both vetiver and tonka individually, I do not care for VT at all. There’s something almost jarring in the way it reacts with my skin. Does anybody else like The Different Company’s Sel de Vetiver? I love it as a warm weather fragrance. I tested Sel de Vetiver alongside FM Vetiver Extraordinaire, and liked TDC much more. But I will have to try some of the other’s mentioned here. Sycamore sounds intriguing. i have a sample coming for the new Dyptique. Of course I would love to try them all! You know, I like SdV, but I tried it early in perfumistahood and drained the sample quickly. Somehow, it wasn’t the kind of sharp, grassy vetiver I’m used to; maybe the marine/salt note was more prominent to me? I really need another sample. What I need is a good 5ml decant to spray liberally. I think lots of people love it…I liked it, didn’t really love it. Very unusual scent though, and well done. Maybe because it’s heavy on the “sel”…I tend to like vetiver only when it augments or is a note wrapped in others…interesting about Sel de Vetiver: It’s one of the few scents I like on me and on my spouse. It definitely reads somewhat differently on each of us. Yes. Love Sel de Vetiver. I have been planning to buy a full bottle and wear the heck out of it this summer, so I found your post very validating. SdV here I come! Here’s another SdV-lover! I do love both vetiver and salty notes and they come together so beautifully in this fragrance. I find it has both depth and brightness, like sunlight reflected in the surface of deep, dark and cold water. So I’ve bought a full bottle, and like you I plan to wear it to pieces this summer. Thanks The world needs more Sel de Vetiver-wearers – now do your duty and get a FB! Suze–if you’re interested in a split, let me know. oops, sorry —I read that as SDV which is very different. Happy to see Kenzo Air get a bit of love!. That was the first vetiver I tried and it was a good intro for me. Introduced my youngest son to vetiver through it as well and he often wears Air, although he calls it “that stuff that smells like Philmont” (a boy scout ranch in northern New Mexico). Vetyverio sounds like something either of us could easily wear. LOL…like the “stuff that smells like Philmont”…that’s funny! Hi Robin. This definitely sounds worth a try (what vetiver isn’t?). I wouldn’t mind finding a vetiver that plays very well with florals. As noted above, N° 19 is the one that does that best for me (vetiver more pronounced in the extrait, I think). I still need to try Guerlain V. pour Elle sometime. Had anyone anything nice to say about Encre Noire pour Elle? That sort of fell quickly off the radar. I should say that I get a good dose of vetiver from my love, Terre d’Hermes, which I think no one has mentioned. More going on than many of the vetiver-heavy compositions, but I think that’s the brilliance of it — many times I think vetiver can be so strong and distinctive that it all but obliterates everything else in the composition. It’s occasionally nice to see it weave in and out of the action like a member of the chorus. That’s a good point, Joe. I love Terre d’Hermes (on my husband more than on myself, for some reason). It’s a beautiful vetiver-based composition. P.S. Others have mentioned KenzoAir, which you shared with me. I love that anise-vetiver combo! Still have not tried the Encre Noire, nor have I seen it anywhere…but mostly didn’t go out of my way to find some because it didn’t much sound like something I’d like. Agree on the Terre d’Hermes! Oh, boy, and my previous point re: Sel de Vetiver is reinforced…I, too, like Terre de Hermes…and as you point out, Joe, that’s another one where it’s not so much about the vetiver as vetiver in something. My fave vetivers are KenzoAir and Sycomore. Also circa-1990 Guerlain Vetiver which has a distinct sandalwood basenote. Hello Joe! Have you compared the parfum and edt of Terre d’Hermes? The edt did not wow me, so I am curious about the parfum. TIA! Thanks Robin, for the review. This is one that I will try! Right now, my favorite vetiver is the one by Annick Goutal, for its pungent seaweedy-ness. I also like Sel de Vetiver and KenzoAir a lot. Sycomore and Encre Noire are both very well done, I think, but neither really grabbed me. Don’t know why! Two others for consideration/comments: L’Occitane Vetyver was very pleasing, as I remember (might be a good entry-level recommendation, too!). And I’ve heard some raves about Mazzolari’s Vetiver. Has anyone tried that one? I gather that it’s floral vetiver blend. Had to go look at my notes — no, never tried the Mazzolari, so no help! The AG, agree, is very inky & a cool scent. Thanks for this review and your perspective on various vetivers, Robin! I like the idea of a floral vetiver, and was hopeful that Guerlain Vetiver pour Elle would fill the bill. Although I do like and wear it, I find the musk outweighs the flowers to my nose (or perhaps I’m just hyperosmic to that particular musk). Will definitely check out Vetyverio! The Guerlain just didn’t grab me in any way, but know lots of other people loved it. I don’t have any left and don’t even remember it that well, except that it didn’t have enough vetiver for me. I had the opportunity to try this yesterday. It’s opening is very pleasant and elegant indeed, as you say, a light take on Vetiver, dirty and earthy it most certainly is not. My only issue with it is that it develops into a skin scent within minutes, I had to remind myself I was wearing it after ten minutes as any projection had virtually disappeared. What was left was very nice indeed, but so soft it would struggle to be heard in the busy olfactory assault that living in London provides. I would buy the fragrance if the opening was representative of the fragrance as a whole. Whilst I don’t always need to wear sillage monsters – indeed a great many of my fragrances aren’t – I would still want a fragrance that I didn’t feel I would have to keep reapplying and reapplying during the day. Curious if you were trying from a vial? I found it much better sprayed…sillage was reasonable for me, as was lasting power. But it’s not a “big” scent, you’re right! No Robin, it wasn’t from a vial, it was from a bottle. I really liked the fragrance, while it lasted, but I concede it was maybe my skin type to blame. I’m looking for a Diptyque and think I’ll probably go with Tam Dao which has been on my list for a while. Oh I don’t know…the first time I wore it, I thought it disappeared quickly but then later I noticed the vetiver and realized it hadn’t really left…. Next few times I was writing the review so I possibly wore it heavily & had less of an issue w/ that. This sounds like a must try for me! Now that the warm weather is finally arriving in the Northwest, I’ve ceased my experimenting with heavy fragrances and am gravitating much more to light, skinscent type fragrances (wearing EL Bronze Goddess almost every day, still looking for a great, warm floral, too). A got a lab sample from a PR company, but I think Aedes & Luckyscent both have it now in the US, and would bet the Diptyque boutiques have it too. Love the Bronze Goddess scent, it’s such a great “don’t have to think about it” summer fragrance. So my sample order finally came in, and Vetyverio was the first juice out of the bottle (in a messy sort of way, nearly spilled the whole thing all over myself!) It smells EXACTLY the same on me as you describe- bright citrus, slight floral, and a bit of vetyver. I quite like it : ) and by boyfriend seems relieved to have to smell-test something that is not super sweet, haha. Cant wait to try this. A ‘light’ vetiver actually appeals to me, and I just am a big Diptyque Fan Club member – I just wish this one was a bit more affordable.